This is for all my avocado lovers out there. You know who you are. This will change your avocado game! I recently went to South Beach for a two-day little getaway and I think the best thing to come from this trip was this dish! I stayed at the Nautilus in South Beach and had the Avocado Toast dish at Driftwood Room the first day of the trip. It was so crave worthy, I had it on day two as well. This dish had pepitas (pumpkin seeds) in it and I am always on the lookout for recipes that use pumpkin seeds. I use Go Raw sprouted pumpkin seeds for TONS of recipes that call for nuts. They are an incredible substitute and so good for you too! Check out this amazing recipe below. Based on the bread and oil you choose, you can make this recipe egg-free, dairy-free, gluten-free, etc. Tailor it to fit your needs! I definitely cannot take credit for the creation of this dish; that is all Driftwood, but I tried to re-create it as best I could. I had to be able to enjoy this little gem in my own home! Drizzle your bread with olive oil or a buttery spread of your choosing and broil in the oven until lightly golden and crispy. Meanwhile, throw some olive oil or butter in a small pan and lightly brown the capers and pumpkin seeds in the pan over medium heat. Watch them carefully so they don't burn and stir occasionally. When the seeds start to brown and smell fragrantly toasted, remove from heat. Chop up your avocado into small squares and put into a small bowl. Squeeze your lemon or lime juice on the avocado and toss to coat. Add the capers and pumpkin seeds; season with salt and pepper to taste. Toss together and slightly mash up some of the avocado in the bowl so all the ingredients stick together. 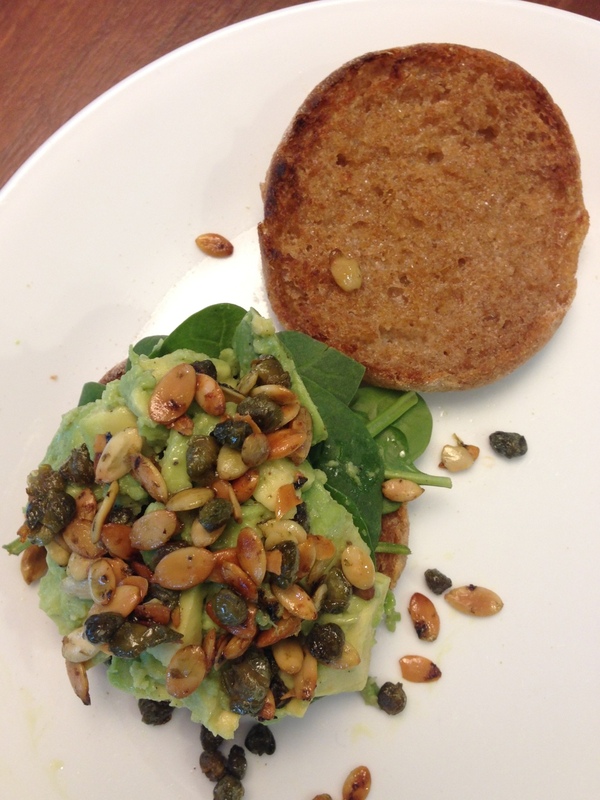 Top your toast with a handful of fresh spinach and top with the avocado mixture. Enjoy! Posted on February 14, 2016 by Kristen Rutter and filed under Recipes and tagged nutfree peanutfree breakfast lunch dinner snack vegan. Cooler weather has hit, the leaves have changed and are falling, and all I hear about on a daily basis from my oldest is how excited she is for Halloween. Yes, my friends, Fall is in full force and I am loving every second of it. It is my favorite season of the year. This nut-free, vegan pumpkin bread is my favorite Fall recipe. It doesn't last longer than two days in our house. It is a recipe that I have shared with friends and family and one that I turn to over and over for parties and gifts. It is quite simply put, delicious. I have never found a recipe, vegan or not, that rivals it. I know that Fall and the coming holidays are laden with products containing nuts. This is a safe go-to recipe for any occasion. Enjoy! Slightly adapted from the Vegan Pumpkin Bread Recipe at hell yeah it's vegan! Preheat oven to 350 degrees and prep a loaf pan by greasing or lining with wax/parchment paper. In a small bowl, mix together the flaxseed meal with 3 tablespoons of water. Set aside for 10 minutes. In a large bowl, mix together all the dry ingredients - flour, sugar, baking powder, baking soda, salt and spices. In a medium sized bowl, mix together the wet ingredients - pumpkin, coconut oil and maple syrup. Add the wet ingredients to the dry ingredient bowl and mix well. Fold in the chopped pumpkin seeds. The batter will be very think and heavy. No worries! Pour into prepared pan and spread until even. Sprinkle top with pumpkin seeds. Bake for 55 to 60 minutes, until top is slightly browned and toothpick inserted into center comes out clean. Let cool for 30 minutes in the pan. If you try to take it out while too hot, it may crumble. Remove to finish cooling on wire cooling rack. Enjoy! Posted on October 19, 2014 by Kristen Rutter and filed under Recipes and tagged vegan nutfree peanut free pumpkin bread. This is a totally impromptu post. This was the first time I have ever made these cookies. I did not plan on posting this recipe or taking photos. In fact, my camera was not even charged and at the last minute before we started chowing down, I took these photos on my phone! 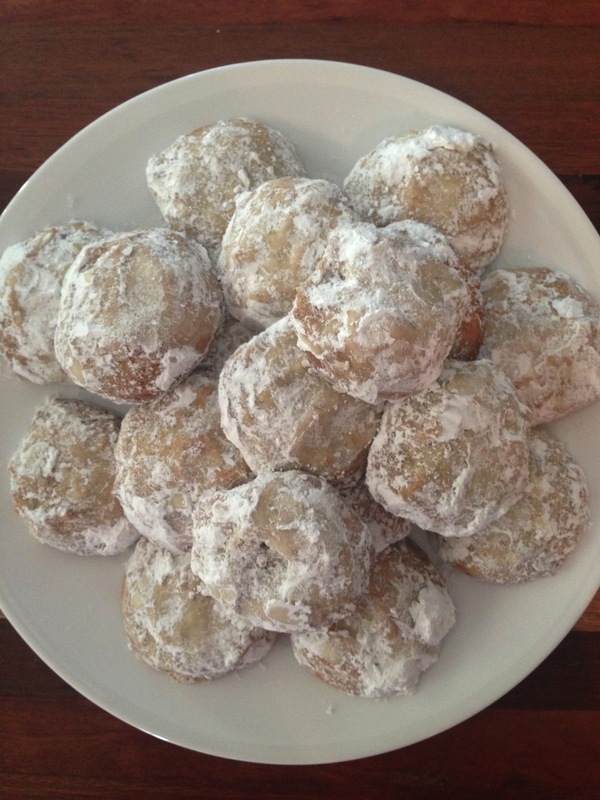 Yes, ladies and gentleman, these cookies are so good, I couldn't wait to post this recipe! Slightly adapted from the Mexican Wedding Cookie Recipe in Roberto Martin's "Vegan Cooking for Carnivores"
Preheat oven to 350 degrees and line a large cookie sheet with wax or parchment paper. Pulse the seeds in a food processor until they are a coarse meal. Add the butter, sugar, agave nectar, vanilla, and salt and pulse until a dough forms. Add 1 cup of flour and pulse until combined. Add the second cup of flour and pulse until combined. Scoup out 2 tablespoon size portions of the dough, roll between your palms to create a ball and place on the baking sheet 1 inch apart. Bake for 15 to 17 minutes. Remove from oven and let cool on the cookie sheet for 7 minutes before transferring to a wire rack to finish cooling completely. Roll, cover, and coat in confectioner's sugar completely and enjoy! My favorite way to enjoys these is with a super hot cup of black coffee! Yum! Posted on June 30, 2014 by Kristen Rutter and filed under Recipes and tagged vegan nutfree peanutfree cookies. Author of nutfreemomma. Mother of 2 little girls, one of whom has food allergies. Group leader for No Nuts Moms Group of Cleveland. Aspiring vegan. I support advertisers on nutfreemomma.com. Visit my contact page for more info.